Just mix and enjoy. Store refrigerated; lasts as long as your mayo or yogurt would to begin with. 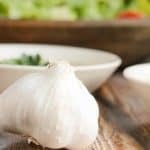 This is a great way to get in your immunity-boosting fresh garlic!